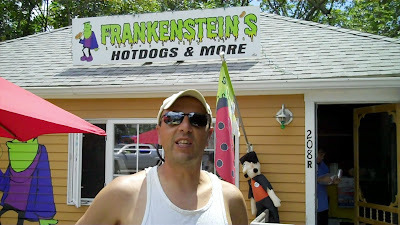 For my second installment of eating a hot dog a day in July, Mrs. HDM, Little Miss, and I stopped in at Frankenstein's at 208R Main Street in Wareham, MA. It's a funky little joint that opened up last September. When you step inside, you can sense the theme of the place. Also inside this day was the lovely and talented Melissa. If you have two functional eyes, you can see the "lovely," her talent (besides slinging hot dogs) is singing! 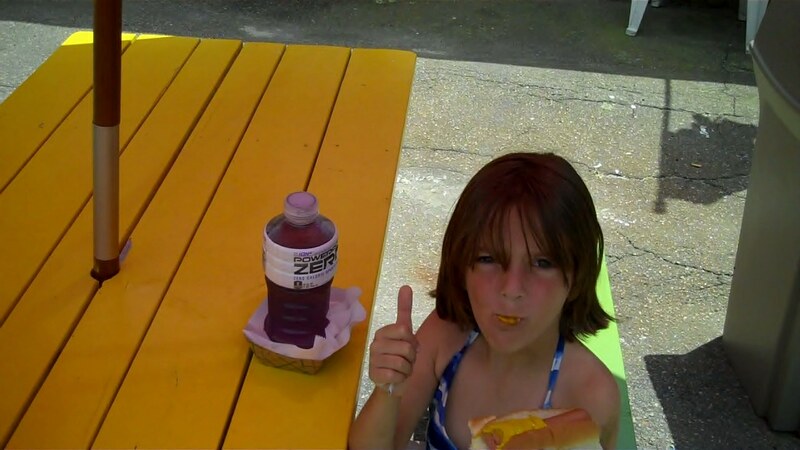 She's the lead singer of Shattered, a rocking band that plays out around Southeastern Massachusetts and Cape Cod. 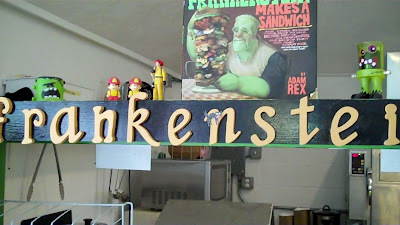 Melissa cheerfully explained the extensive menu at Frankenstein's- they have something for everyone! 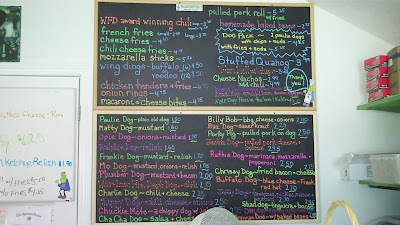 There are weekly and daily specials too. 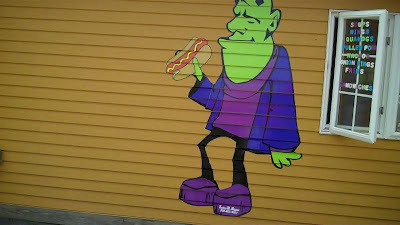 Frankenstein's serves up a Kayem Old Tyme Frank on the classic New England split top roll. 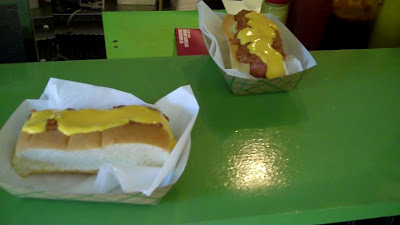 As with most cool little hot dog joints, it's the toppings that make it special. 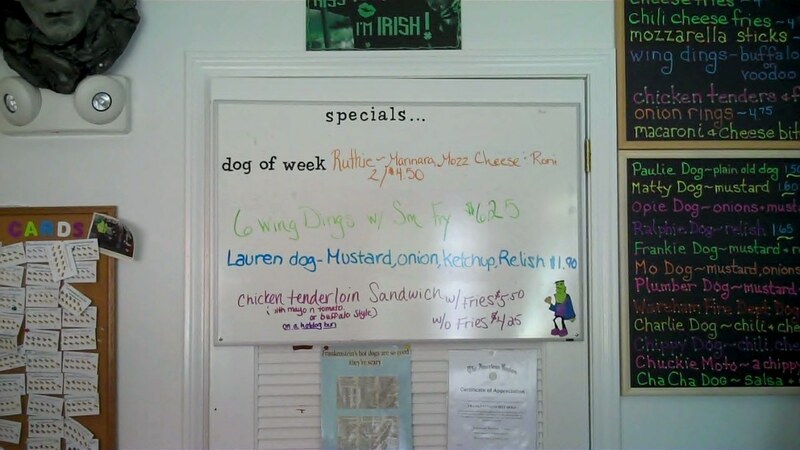 The specialty of the house is the award winning Wareham Fire Department Chili Dog, known as "The Charlie Dog." The guys at the firehouse in Wareham like to fire things up in the kitchen too, and they are the reigning champions of the Annual Fire Fighter's Chili Challenge, an event held every year to benefit the Muscular Dystrophy Association. 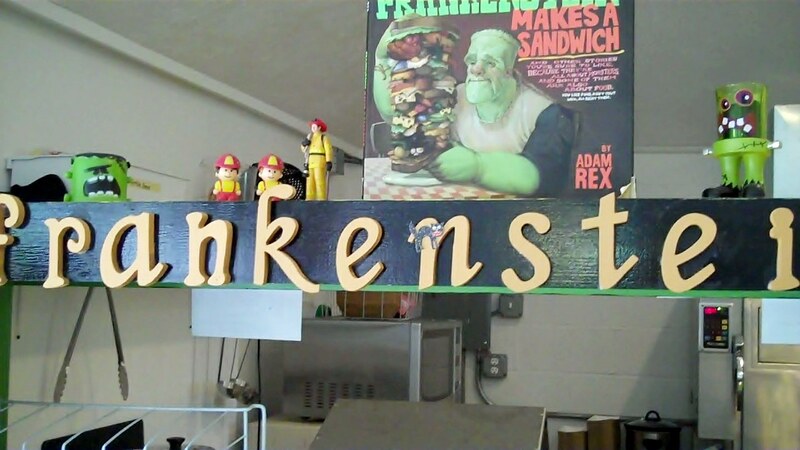 Frankenstein's uses the championship recipe. Of course Mrs. HDM and myself HAD to order the chili dogs. 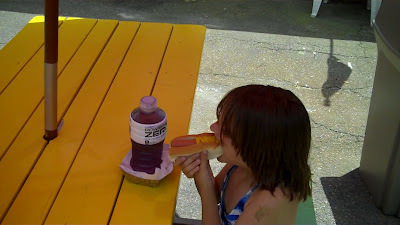 Little Miss had a "half mustard, half plain" dog. 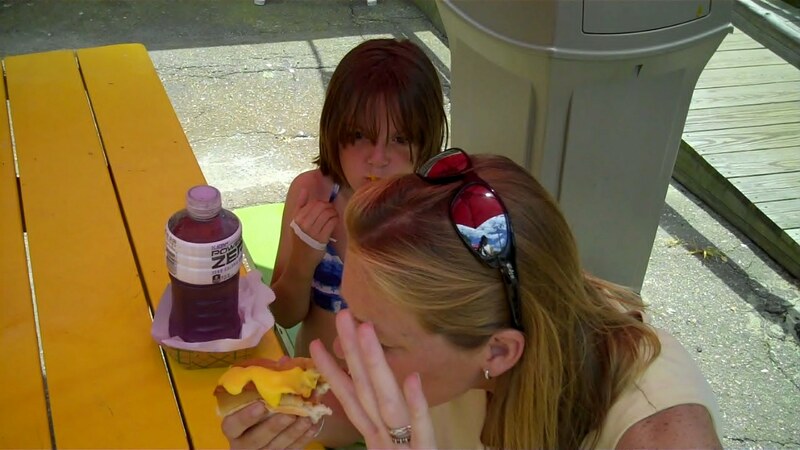 No ketchup for Little Miss, her parents are raising her right! True to form, the good humored and very gorgeous Mrs. HDM wanted no part of having a picture of her eating on the internet! 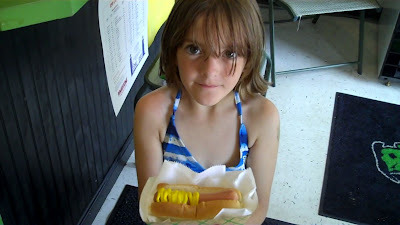 I aint so shy, so I CHOWED DOWN- boy was it yummy! 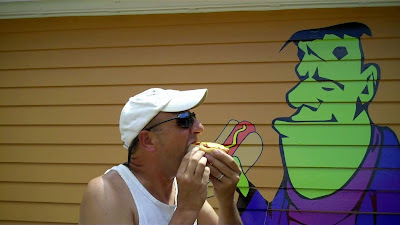 I could taste why the guys from Wareham Fire are the Chili Champs, the chili had a subtle spiciness with a kicking back end bite. 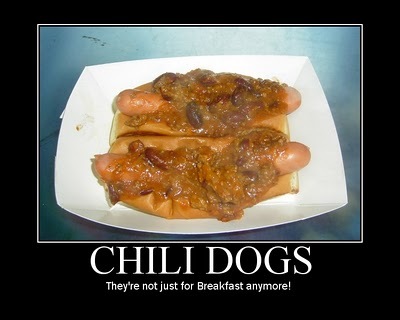 Damn fine chili dogs! 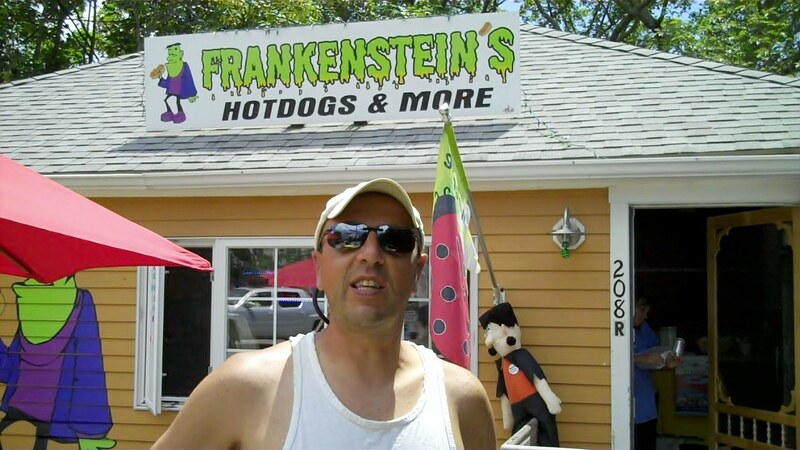 Check out the video of our visit to Frankenstein's on Hot Dog Stories.